Pentair Technical Products announces a fully featured, expanded line of Hoffman™ brand ZONEX™ IECEX- and ATEX-Certified* Enclosures. We have expanded the ZONEX Enclosures line to include small screw covers and inch dimensions, as well as expanded and enhanced modification and population capabilities, to better meet the needs of the marketplace." Pentair Technical Products announces a fully featured, expanded line of Hoffman™ brand ZONEX™ IECEX- and ATEX-Certified* Enclosures. ZONEX hinge-cover and screw-cover enclosures are designed for use in applications where “increased safety” protection (Ex e), as defined by the ATEX Directive 94/9/EC, is acceptable to safely house electrical components in Zone 1 and Zone 2 rated areas. 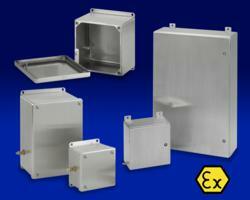 These enclosures are not intended for use in explosion-proof or flame-proof (Ex d) applications. The expansion of the Type 316 stainless steel ZONEX platform includes new inch-based offerings in an extended range of sizes, including hinge and screw cover versions. All ZONEX models are now offered with enhanced customization options including: material changes, size changes, paint options, holes and cutouts, population of any ATEX-certified terminal block, stopping plug or drain, mounting bracket changes and other modifications. Hinge cover models are ATEX, IECEX, and AEx certified. Screw cover models are ATEX and IECEX certified. New inch-dimensioned hinge cover enclosures are available in sixteen standard sizes from 12" x 12" x 6" to 36" x 24" x 8" and come standard with NEMA-style mounting feet on the top and bottom, a full size bottom gland plate and a one-piece continuous gasket on the door and gland plate. Hinge cover models feature a 10-mm brass internal/external bonding provision, a quarter-turn latch with a 3-mm double bit insert and the required panel and bonding hardware. Side mount brackets, a high-temperature silicon gasket, gland plate changes from zero to four and enclosure dimension changes up to 60" x 36" x 18" are available upon request. Screw cover enclosures are available in five sizes ranging from 4" x 4" x 3" to 10" x 10" x 5". These enclosures feature welded-on, full-width top and bottom wall-mount brackets, a 6-mm internal/external brass bonding provision, stainless steel cover screws, a one-piece continuous gasket and required panel and bonding hardware. A high-temperature silicon gasket is available upon request. Pentair Technical Products, a Pentair global business unit, is the leading provider of worldwide product and service solutions for enclosing, protecting and cooling electrical and electronic systems. Its industry-leading brands—Hoffman™, Schroff™ and McLean™ Cooling Technology—provide a broad variety of standard, modified and engineered solutions to the commercial, communications, energy, general electronics, industrial, infrastructure, medical and security and defense markets.